That's all from us on League Cup final duty - you can follow the rest of tonight's European action here and read all of the reaction from Wembley here. Daniel Sturridge was not fit enough to take a penalty then? These two sides do not have long to wait to meet again - they are back in Premier League action at Anfield on Wednesday. Liverpool boss Jurgen Klopp, speaking to Sky Sports: "I am disappointed of course with the end. Pleased with a lot of things I saw in the game. "Manchester City should not have scored their goal, we had to strike back and we did. We played well in a lot of moments. It doesn't matter what I say now, it won't change the result. "We all have to feel it now. It is was it is. You can fall but it is how you stand up. We cannot change this game now, we have to carry on and we will carry on." Liverpool manager Jurgen Klopp says he is pleased with many of the things he saw in the game but is naturally disappointed with the result. "We tried everything," he said. Former Oasis man and famous Manchester City fan Noel Gallagher says that City are capable of going on a run now and challenging for the title. We've seen Sturridge and Sterling, but the third act in the trilogy of Liverpool's nearly men of 2014 is now in action as Luis Suarez and co aim to shine for Barcelona. Follow the Barcelona game here. Manchester City striker Sergio Aguero: "I'm very happy for this club - we are here to win trophies and we are happy. "Liverpool are a good team, difficult. I'm happy for Willy Caballero because he played every game in the competition." It's a good question Ryan, and one plenty of people are asking. Ryan Lloyd: Why didn't any of Liverpool's attackers and leaders take penalties? Sturridge? Hendo? Origi? Milner? Manchester City Manuel Pellegrini, speaking to Sky Sports: "We deserved to win the game, we missed chances but if you asked me which way I'd prefer to win I'd prefer to win it is this way. "I'd rather lose the title than lose my word. A lot of media were waiting to criticise me if Willy Caballero makes a mistake. I had a lot of trust in Caballero. I am very pleased for all the players and staff but more for him because he deserved it. "We are working very hard. I don't remember Willy making one save in the 90 minutes. They draw in the last eight minutes and it was not easy for me to make a change but we finished the better. "To win a title in Wembley is very special. We are not thinking about what we can win, we are thinking about the next game - against Liverpool - we are nine points behind the leader but we have a game in hand." "I had a difficult decision with the FA Cup but I think this title and the win in Kiev support my decision." This was the fourth of the nine League Cup finals to be played at the ‘New Wembley’ to go to extra time. Live now on 5 live is the 606 phone-in. Join Ian Wright to discuss a big day in the Premier League title race - particularly for Arsenal fans - plus the League Cup final. Mwansa Lombe Kaluba: Congratulations #MCFC from a #LFC fan. I am happy for Manuel Pellegrini after the way he has been treated he deserves credit. Antoine V: Poor Mignolet. Pull off a few great saves... But everyone just remembers the clangers... Just see CBeebies for proof. 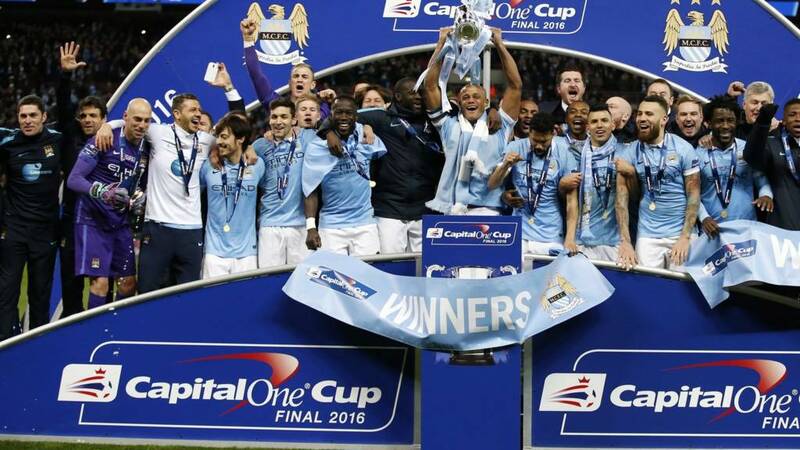 Manchester City have now won four of their five League Cup finals (1970, 1976, 2014 and 2016). Liverpool lost a League Cup final for the fourth time (1978, 1987, 2005 and 2016). Former Swansea boss Garry Monk: "Manuel Pellegrini will be over the moon. He is there to win silverware. I am sure he will have a good glass of wine tonight to celebrate." Matt Harding: Dear Liverpool, I hope it takes about 3/4 weeks for you to get over this defeat. Man Utd.